Trying to beat the summer heat? Why not find a spot in the shade and read some cool cli-fi? I’m pleased to announce that I’m having a summer sale on climate fiction (cli-fi). My two novels, Change and Goodbye Miami, are on sale on Amazon for just 99 cents from August 19 through August 26. My short story collection, Strange Beginnings, is also available for free on Amazon from August 18 through August 22. 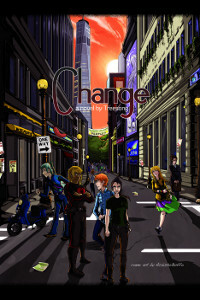 In Change, Sarah Athraigh, an environmental activist from Southern Illinois, stumbles into the midst of a hidden war between occult factions that are grappling with the root causes and dire consequences of climate change. As she goes on the run, she soon finds herself on a journey of discovery, searching for the unusual allies and innovative ideas that will help her to make a difference for the better in a dangerous world. In Goodbye Miami, Kass, an American climate refugee, flees Miami in the wake of a hurricane that leaves most of the city underwater. After moving in with her cousin in Southern Illinois, Kass struggles to deal with her displacement. She hopes to find a way to return to the city that she loves. But thanks to global warming, that city is now underwater. What starts as a search for survival quickly evolves into a struggle for the future of Miami — and the world. Strange Beginnings is a collection of short stories by yours truly. These tales all take place in the same setting as my cli-fi novel, Change, and all relate in some way to the theme of strange beginnings — and often strange endings. Climate fiction, also known as cli-fi, is a newly emerging genre of fiction. Cli-fi stories explore the role of the climate and human-caused climate change in our lives. They range in tone from post-apocalyptic tales of survival to present-day tales of activism and advocacy for climate justice. In addition to providing quality entertainment, cli-fi stories also provide a unique opportunity to reflect on the real-world climate crisis and our responses to it. Cli-fi authors use the ancient art of storytelling to explore global warming and related issues in a way that goes beyond what any charts or graphs can offer. Compelling characters and exciting plots draw the reader in and may inspire them to feel more personally invested in responding to the real-world climate crisis. In related news, I’m currently working on two other cli-fi books: a sequel to Change called Order and a short story collection with the working title Cli-Fi Plus. I’ve also recently started work on my first superhero-themed novel. To receive the latest updates on my writing and superhero adventures, please sign up for my newsletter. Also, please share this post with anyone you know who may be interested cli-fi. Thanks! ‹ Will “Goodbye Miami” Become A Reality?